Your travel guide to Sulawesi, one of the four Greater Sunda Islands of Indonesia, being enormous in size and population. It is formerly known as Celebes to the Portuguese.The shape of this island is unique and easily recognized by many and aptly so as the place is full of unique cultures, unexplored land, mountains and even the sea. 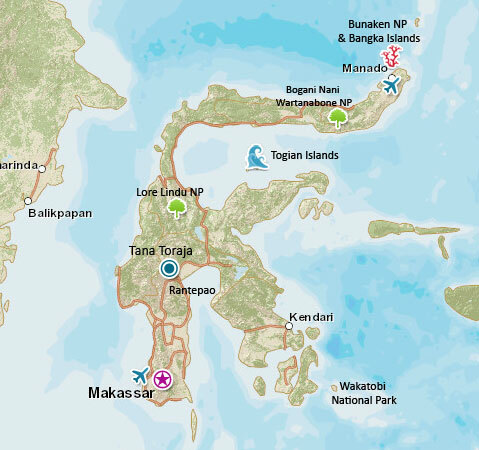 Sulawesi’s population is 14 million, about 7% of Indonesia’s population and the largest city here is Makassar. Majority religion is Islam with next substantial minority being Christian. Sulawesi is also rich with a variety of flora and fauna from mix of both Asian and Australasian species. The national parks that protects this rich ecosystem had been proposed to UNESCO World Heritage Site. At the north, you will find the best dive sites of Indonesia like Bunaken, crystal clear seas and remote islands. At the south, the popular Tana Toraja had spellbound many travelers with their unique culture and rituals, whereby the funeral rites are since ancient times with elaborate death rituals. Wakatobi Island – another diving location in Sulawesi with more than 25 coral reefs and 900 marine species.